Description Recalculate 2D and 3D geometry headers from headers and surveys. This process recalculates 2D and 3D geometry headers based on the values of other headers. It will not allow you to manipulate the headers that fundamentally define a particular volume. For example, if the input is a 3D volume defined on INLINE, CROSSLINE, and OFFSET, then those headers cannot be modified. It is your responsibility to ensure that the input trace headers are sensible! 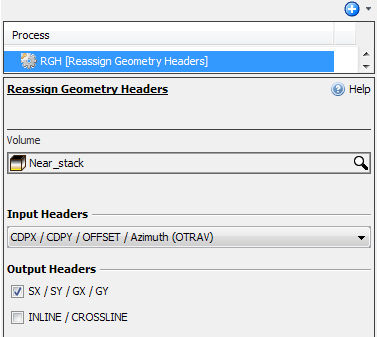 Select Reassign Geometry Headers and type a name for the process. At the Input Headers section, select which trace headers to be reassigned (see Trace Headers). At the Output Headers section, select which trace headers to be produced. Any of the above trace headers can also be set, depending on the mode.